Participants of eHealth2018 can request 12 Diplom-Fortbildungs-Programm (DFP) points for attending the conference. To receive your points, please send an email to office@dhealth.at before 22.08.2018 providing your first and last name as well as your ÖÄK number. In case of cancellation until 15. April 2018, 50% of the total amount are charged. In case of cancellation after 15. April 2018, 100% of the total amount are charged. Please be informed that there will be pictures taken during the conference onsite. Those pictures may be published afterwards for documentation purposes of the event. For further information regarding data protection please see Impressum. List of hotels close to the conference centre. From Vienna airport, take the CAT (16 min) to Wien Mitte. Continue with U4. See also City Airport Train (CAT). There are only limited parking slots at the conferences center. Therefore, we suggest to travel with public transportations. Opposite the entrance of the Orangery on Schönbrunner Schloßstraße, there is a fee-paying car park. Details concerning parking can be found here. 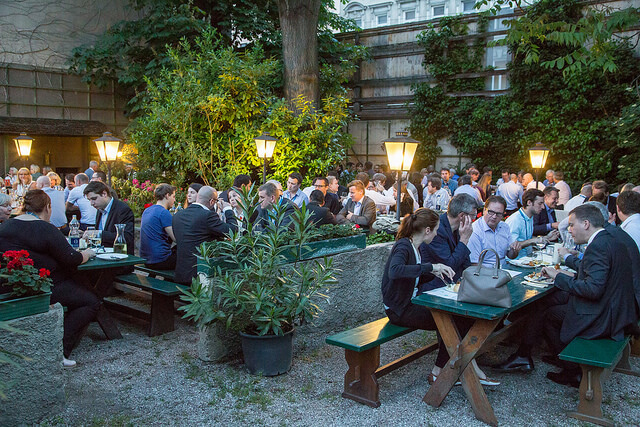 On Tuesday evening, a social event will take place at the traditional Viennese "Heuriger" 10er-Marie. Only participants of the eHealth2018 can register for the Heurigenabend.